InterContinental Hotels Group (IHG), one of the world’s leading hotel companies, today announces the opening of the EVEN® Hotels brand’s fourth hotel and second New York City location, the 202-room flagship EVEN Hotels Brooklyn.Located at 46 Nevins Street in Downtown Brooklyn, the hotel is also adjacent to IHG’s Holiday Inn® Brooklyn Downtown which opened in April. EVEN Hotels is IHG’s newest lifestyle hotel brand, and was created with wellness at its core. The brand is designed to help travelersEat Well, Rest Easy, Keep Active and Accomplish More, making it ideal to better serve wellness-minded travelers in the New York City area. As New York City’s most populous borough, Brooklyn is leading the country in the construction of new apartments in 2016 and has seen huge economic growth, making the need for places to stay, whether for business or pleasure, more important than ever before. With the opening of EVEN Hotels, visitors to Brooklyn can now look to maintain their wellness routines when they stay at the hotel, while also being in close proximity to culturally local experiences that Downtown Brooklyn is known for. The hotel is located within walking distance to many places including Forte Green Park where guests can visit the Saturday GreenMarket held year round; catch an innovative performance at BAM (Brooklyn Academy of Music); or even try their hand at indoor rock climbing at Brooklyn Boulders. As soon as guests arrive at EVEN Hotels Brooklyn, natural elements of wood and living plants create a welcoming and revitalizing space. The hotel offers different design and technology elements to help guests maintain the balance they desire. Guests can also expect a personalized service culture where team members champion wellness and inspire guests to stay on track while on the road. Eat Well – The Cork & Kale Market and Bar offers a menu of freshly prepared food items such as a yogurt bowl with house made granola, a customizable signature black kale salad,flatbreads, all-natural burger and indulgent desserts. Guests can also enjoy organic and natural libations, freshly-squeezed orange juice from a Citrocasa machine and free filtered water available throughout the hotel. The hotel has also partnered with purveyors like the Brooklyn Brewery to serve local goods in the restaurant. Keep Active – For guests desiring a great workout, the property features a natural light filled two-level Athletic Studio which also includes a two-story living green wall. Spin and yoga classes are offered in addition to group runs to the Brooklyn Bridge Park led by the property’s Chief Wellness Officer. The 2.2 mile loop can easily be modified to a 5k or 10k course for runners or walkers looking to increase their distance. For those who prefer to work out on their own, guestrooms feature an In-Room Training Zone which includes a foam roller, yoga mat, yoga block, core exercise ball and the EVEN Hotels Trainer, a mounted fitness wall which includes resistance bands. The brand also developed 17 fitness videos, with an additional two created exclusively for the Brooklyn property by celebrity trainer David Kirsch, and a robust in-room training guide which shows guests different ways to use the equipment. Rest Easy – Restful environments are essential to maintaining balance, and a calming, open design throughout EVEN Hotels sets a relaxing tone within the property. Guestrooms offer a modern yet comfortable environment and feature eucalyptus fiber linens that offer a cooler sleep; fully glass-enclosed rainfall showers; naturally derived bath products exclusively available from EO and color LED mood lighting. Accomplish More – Ergonomically designed movable work spaces at the property are configured to integrate with guests’ preferences, ensuring they can complete work comfortably and efficiently. Guestrooms feature both moveable desks and stand-up desk options. Places to sit back, relax and catch up on the day include the hotel’s outdoor garden. Best described as an urban chic oasis, the garden features exposed brick walls, ample comfortable seating, an abundance of greenery, great lighting in the evening and great sun exposure during the day, giving guests space to relax and rejuvenate whenever they like. Free Wi-Fi is also available throughout the hotel. 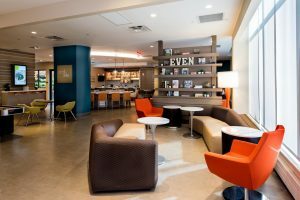 Beyond the physical property, EVEN Hotels supports the needs of travelers through wellwellwell.com, a wellness travel site designed to provide useful content such as articles and tips on how to exercise, eat, rest and find the best local places while traveling to cities across the country. Written by a dedicated editorial team of health and wellness leaders, lifestyle experts and seasoned travelers, wellwellwell.com is a go-to source for healthier, happier travel.